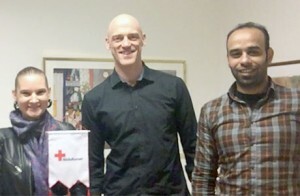 Veronica Hjelm, Pontus Wärnestål and Maher Alholayb are all involved in the project. Students in their second year of the Digital Design and Innovation programme are currently working in a design studio project to create a service that helps new arrivals and refugees to find friends in the new country. The project is directed by the Red Cross and its campaign on integration through the effort “Språkvän” (“language friend”) and uses language as a base for people to more easily find and make new friends.